Ronald McDonald House Charities® (RMHC® ) Singapore has one simple mission – to improve the health and well-being of children in Singapore. One of its core programmes, the Ronald McDonald House TM at National University Hospital (NUH), was built on the belief that nothing else should matter when a child is sick, and that the love and comfort of family can be as powerful as the strongest medicine. 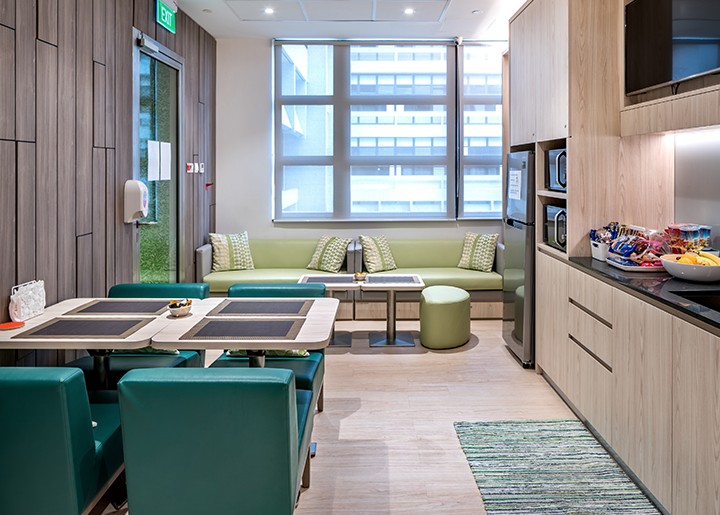 Opened in January 2013, this “home-away- from-home” has provided more than 900 families with a place to stay overnight and be close to their hospitalised child, all at no cost. 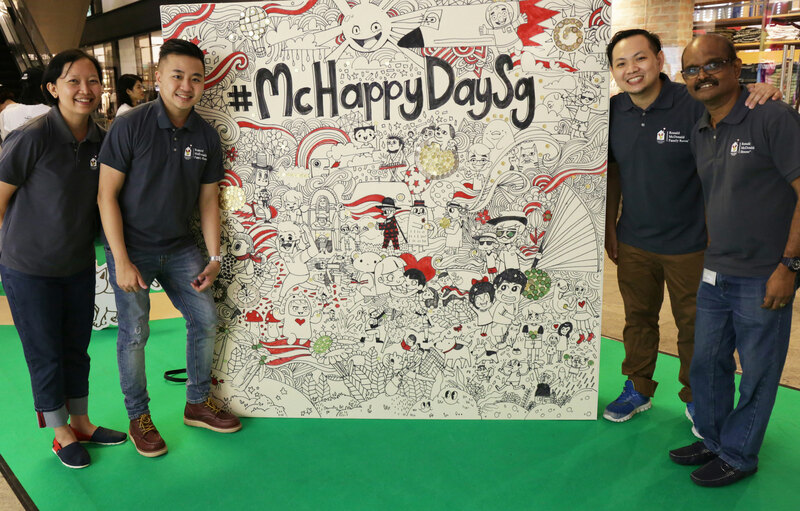 Last year, in celebration of McHappy Day, the largest annual fundraising event for RMHC Singapore, we initiated a series of activities to demonstrate how small change can make a big difference in the lives of young children. We kicked-off fundraising with a LIVE art installation at the high-traffic atrium of 313@Somerset. 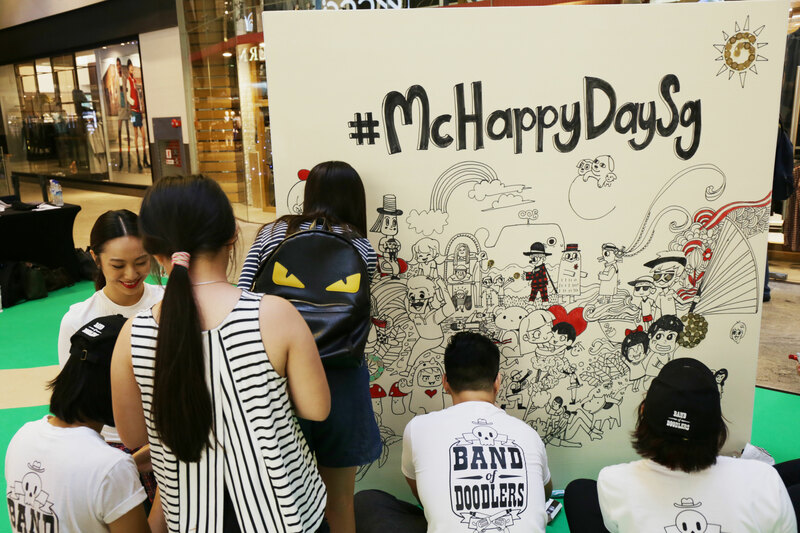 In collaboration with creative expressionists The Band of Doodlers, art murals depicting the hopes and dreams of RMHC ® Singapore beneficiaries were created. The artists completed the murals using small change that had been donated to RMHC Singapore, further illustrating how a small coin donation can make a big difference to the lives of children and their families. 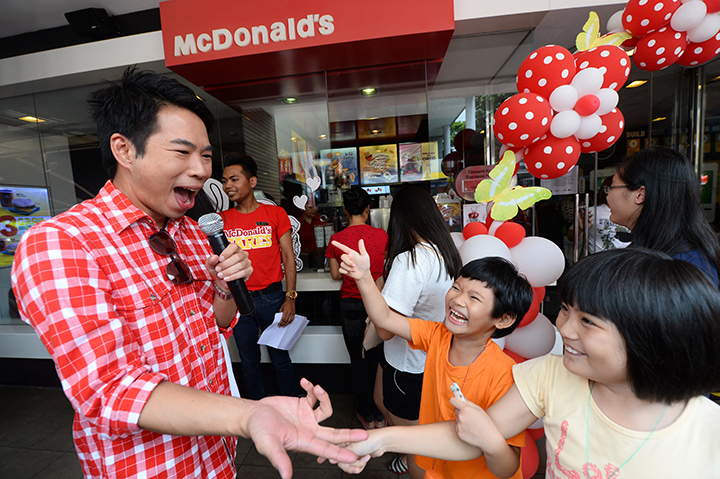 Streamed LIVE on the McDonald’s Facebook page, McDonald’s Facebook fans shared their wishes for RMHC Singapore beneficiaries. Close to $14,000 worth of loose change was donated via our donation boxes in restaurants across the island for McHappy Day 2016, which ran from 23 to 28 October. In addition to this, we also donated $1 to RMHC Singapore for every Chicken McNuggets® Extra Value Meal TM purchased during McHappy Day. 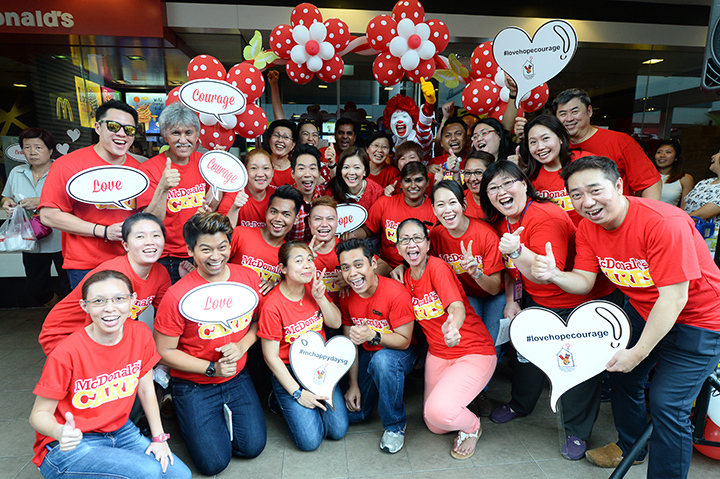 Together with our customers, an additional $52,000 was raised for RMHC Singapore. As part of our annual McHappy Day efforts, from 1 to 15 November 2015, McDonald’s® will be donating S$1 for every purchase of a Strawberry Sundae in our restaurants to help raise S$50,000* for the Ronald McDonald House Charities (RMHC) Singapore. 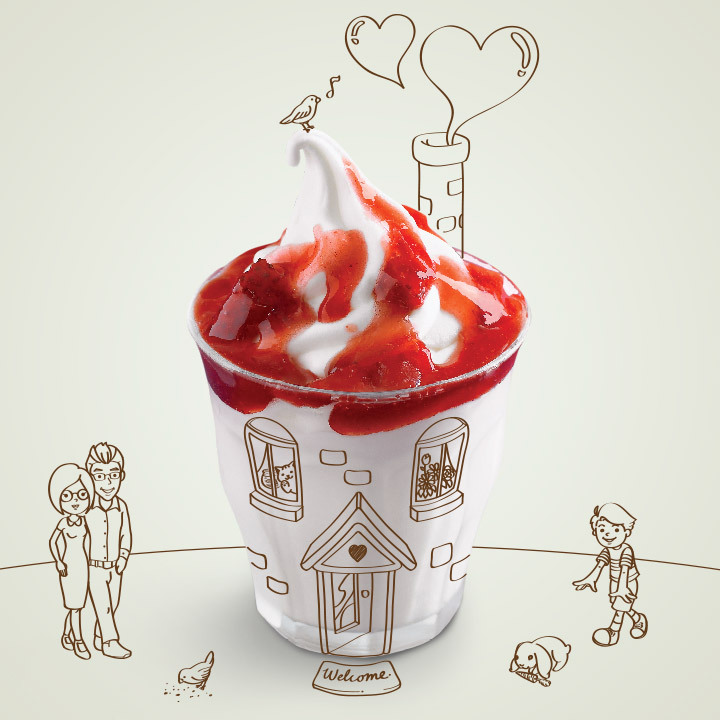 Purchase your Strawberry Sundae and be part of our McHappy Day 2015 initiative to bring love, hope and courage for children and families supported by RMHC Singapore. Share your love and support for this initiative on your social media platforms with the hashtags #mchappydaysg and #lovehopecourage! Do your part to help those in need by purchasing your Strawberry Sundae today! *Donations will only be collected between 1 to 15 November 2015, and will be capped at S$50,000. Thereafter Strawberry Sundae purchases will not include S$1 donation. A day of love, hope and courage with Ronald McDonald and families at the restaurant. A sanctuary is a place of safety and protection, offering its inhabitants rest and recuperation. At the National University Hospital’s (NUH) Paediatric Intensive Care Unit/High Dependency ward, many parents spend sleepless nights at the hospital keeping vigil by their child’s bedside. Designed to be a ready sanctuary, the newly opened Ronald McDonald Family Room at National University Hospital was established by the Ronald McDonald House Charities (RMHC) to offer parents greater care, comfort and support during an emotional period. A week after her daughter was admitted into the hospital, the Ronald McDonald Family Room provided Ms Karmilah a quiet space to rest without leaving her daughter’s side. No longer having to sleep on the chair in her daughter’s room, she was also relieved of the backaches that developed as a result. Cosy and comfortable, the aim was to evoke the feeling of a room in a caring, peaceful home where parents like Ms Karmilah could conveniently rest without being too far away from their child. 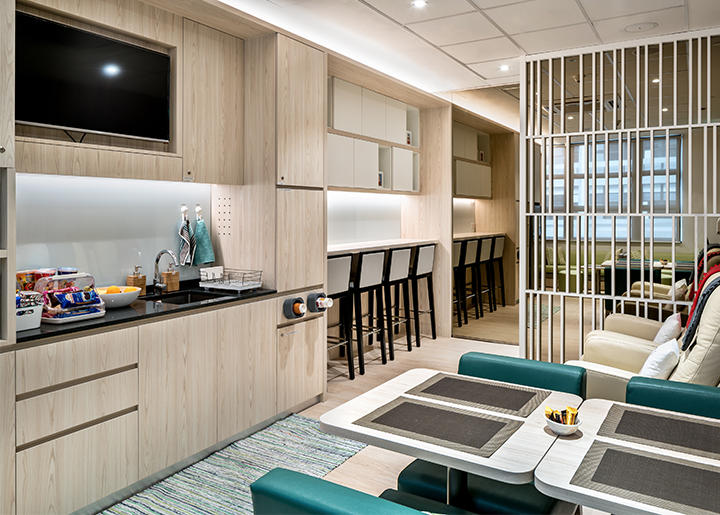 A kitchen area has been set up with amenities like a fridge, microwave ovens and water dispensers, and stocked with a variety of snacks and beverages for occupants of the room. For Ms Karmilah, staying at the Ronald McDonald Family Room meant that she could be readily available for her daughter without having to rush to and from the hospital. This way, she is able to remain closer to her daughter and provide her with the care and support that she needs. During her stay, she found great comfort in the RMHC team and volunteers who frequently offered kind words of encouragement. It was there that she also met other parents going through challenging situations and through conversations with one another, developed a sense of mutual support. When a child is hospitalised, the love and support of family is as powerful and essential as any medication. Recognising this, the Ronald McDonald Family Room is built to enable families like Ms Karmilah’s to stay constantly close, taking care of parents as they watch over their children. 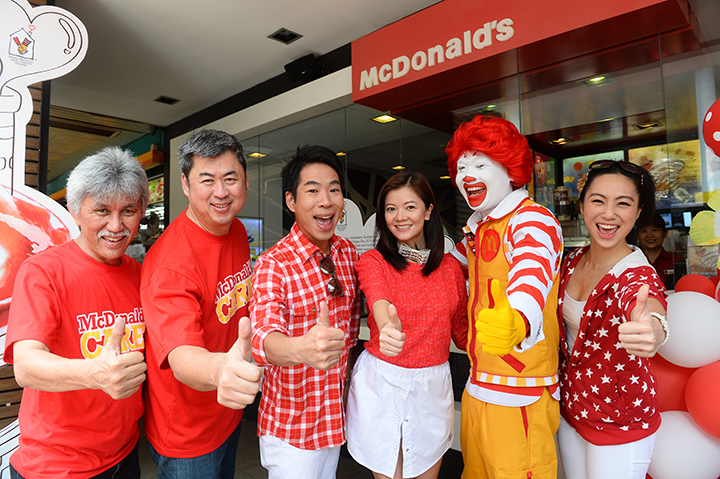 Find out more about the Ronald McDonald House Charities Singapore here.